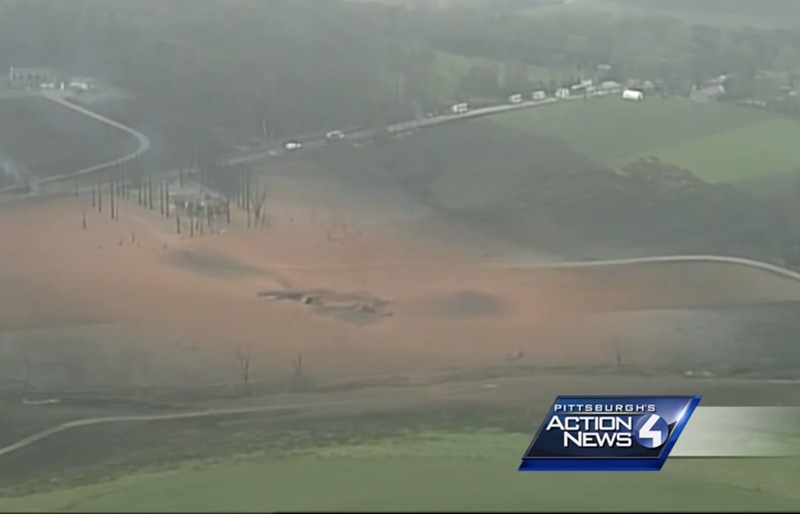 On Friday April 29th, 2016 at around 8:13 am, something horrible occurred in Salem, PA. Workers at the Delmont Compressor station heard a massive explosion, and determined that one of their nearby Spectra Energy Texas Eastern natural gas transmission pipelines had been breached and exploded. They began the shutdown process on the line, and reported the explosion to the National Response Center about an hour later. The plume of gas and resulting smoke from the fire was so huge it showed up as a false weather front 40 miles long during the weather segment of the news. 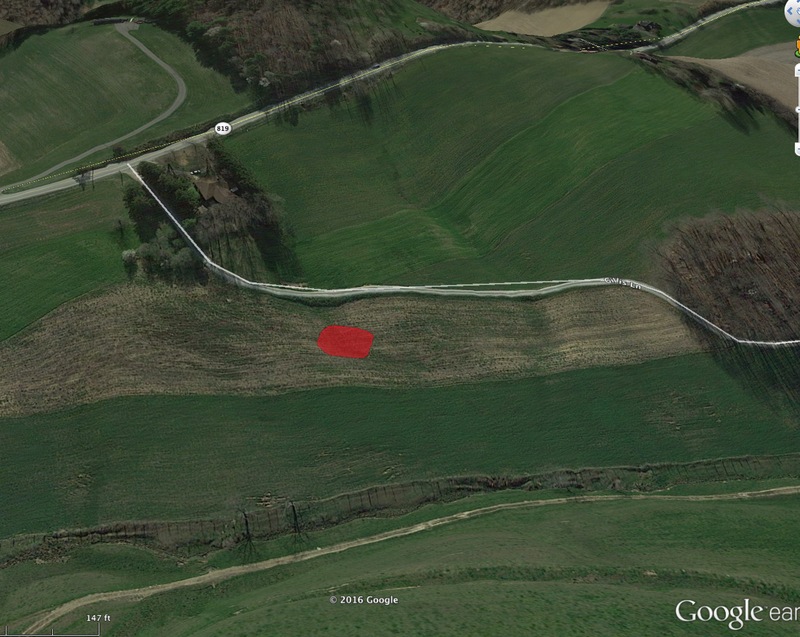 The approximate site of the breach is marked near the bottom-middle of the picture in red. “House A”, 200′ from the breach, was completely destroyed and razed to the ground, along with all the trees surrounding it. A 26 year old man was admitted to the hospital with 3rd degree burns over 75% of his body. Trees and telephone poles thousands of feet from the explosion were charred and smoking hours after the incident occurred. As with many blasts, the blast zone and heat focus was asymmetrical due to the terrain and the exact nature of the blast. In this case, the pipeline was in a bit of a valley. Geography and prevailing winds pushed the heat towards House A and House B. The Pipeline Hazardous Materials Safety Administration (PHMSA), who is charged with regulating pipeline safety, performed a preliminary inspection and determined that it had “identified evidence of corrosion along two of the circumferential welds: one at the point of failure and another excavated after PHMSA’s response to the Failure Site. The pattern of corrosion indicates a possible flaw in the coating material applied to girth weld joints following construction welding procedures in the field at that time”. A spokesman for the pipeline company, Spectra Energy, stated that an inspection in 2012 “revealed no areas requiring repair or remediation before the next inspection”. Records were checked for seismic activity or other construction that might have impinged on the pipeline, but no definitive conclusion was reached. Fast forward five months, to September 2016, and clearer picture emerges. As it turns out, Spectra’s comment immediately after the blast was very carefully worded. While they may not have found any areas “requiring repair”, they did in fact find corrosion at this exact site. And not just a tiny bit. In fact, Spectra admitted that a routine inspection in 2012 showed a 30% decrease in the thickness of the pipeline wall precisely in the location where the pipeline blew. Let that sink in. Thirty. Percent. Despite this, a Spectra Energy spokesperson was quoted said this about the “It was very small. It was smaller than any threshold we would have been required to investigate”. What this means is that Spectra believed that 30% decrease in pipeline thickness was no cause for alarm, and they let it sit there un-inspected for another 4 years until the explosion happened. They remain mystified as to why it occurred. Maybe the gas was too hot, with the breach happening near the compressor station. Maybe the tape used to join welds was bad. Or maybe it was “something else” local to that site. The pipeline company shrugs and apologizes profusely to the family of the man who was burned over 75% of his body. There are “no words” for he went through, they say, and in the next sentence they go onto explain that their models and “the science” indicated that what happened could not have happened. I believe strongly in Science, being an engineer by profession for nearly 30 years. But not in “Science” where arbitrary numbers and models are used as an excuse for a company to cut corners. All this information is particularly chilling when you compare and contrast the Spectra Texas Eastern pipeline with the PennEast one. The Texas Eastern line was 30″ in diameter, and was most likely considered a “class 1” or “class 2″ location in terms of safety (this is determined by how many residences or businesses are close to the pipeline). At the time of the blast it was operating at about 1,039 pounds per square inch (psi), with a maximum allowable pressure of 1,050 psi. This is a bit smaller than PennEast and at lower pressure (PennEast is 36” in diameter with a maximum pressure of 1480 psi). Hence a breach of PennEast would result in a larger area of devastation than in these pictures. As mentioned above, the Spectra Pipeline lost 30% of its thickness. What if something similar happened with PennEast? Most of our areas are classified as Class 1 or Class 2 like the explosion in Salem, PA, so we have apples to apples in that regard. We also have the thicknesses for PennEast from a previous blog post on that topic. Assuming Class 2 pipe, that’s 0.634″ thick (for contrast: class 4 pipe, the safest, would 0.951″). A loss of 30% of thickness would drop the pipe from that down to only .444 inches. For reference, the safety margin for the pipeline would be eliminated entirely at a thickness of .38″. So the equivalent situation for PennEast would be an inspection from 2012 allowing a pipeline to go on with only 0.06″ safety margin in the pipeline thickness. Why do we care about this? Because FERC is allowing PennEast to run PennEast a LOT closes to houses than the case of the Salem blast. Remember, in the Salem blast a house 200′ feet away was burned down by a smaller pipeline with less pressure than PennEast. Here’s the Kelly-Mackey farm on Sanford Road. 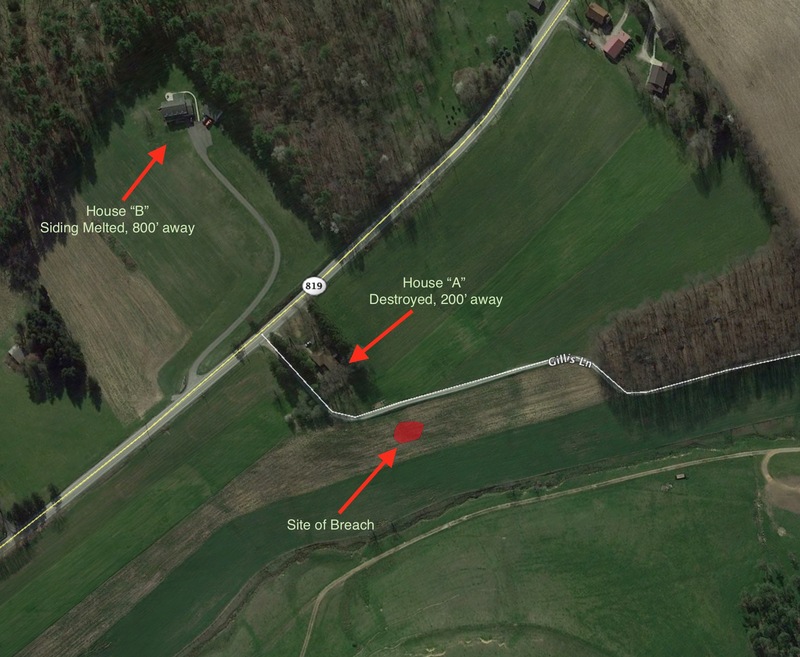 The HDD tunnel entrance for the pipeline will be about 65′ from their farm house. Here is the pipeline construction near Old Route 518 in West Amwell. The pipeline will be 100′ from one house, and 50′ from another. These are just a few of many. In all, the PennEast Draft Environmental Impact Statement identified many structures and houses that would be a mere 50′ from the pipeline construction. Hundreds more are within the same 200′ zone as the “House A” that was burned to the ground by a smaller pipeline under less pressure. This is why people worry, and this is why people protest. Pipeline companies ignore signs of corrosion and serious issues, and wait years to reinspect known areas that have problems. They deliberately build pipelines near homes and schools and commercial centers, and then just shrug and write off the loss if an explosion happens. FERC needs to wake up and disallow this sort of thing. Ignorance was acceptable in the 1950’s when we knew so little about…well, most everything. But this is 2016. We know pipelines corrode and that often the pipeline companies have no idea why. We know they explode. So why on Earth are you still allowing them to endanger our lives in this way?